This usually crisp chicken is marinated with har cheong ?? (Chinese shrimp paste). This is the most important ingredient for Prawn Paste Chicken, other than rice flour, chicken and egg. Add sugar, oyster sauce, light sauce, egg, rice flour and har cheong to chicken. Stir thoroughly. Pour in the corn flour and mix well. Marinate at least 3 hours to half a day, turning over once mid-way. To fry, bring chicken to room temperature. Prepare a deep pot of hot oil. When oil is hot enough, reduce the heat to medium. 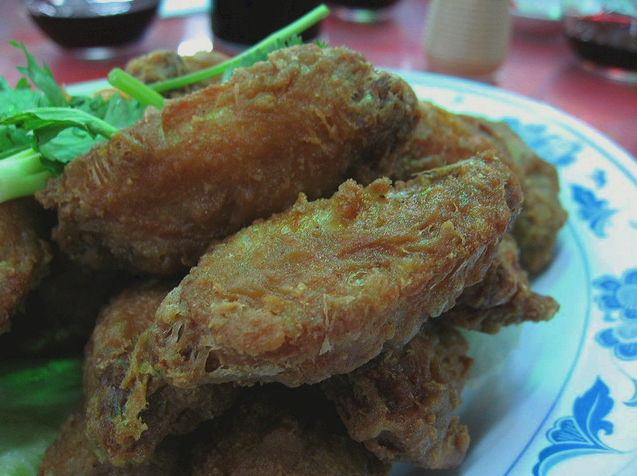 Deep-fry chicken in oil over medium heat till cooked through and lightly golden brown. Drain in a sieve lined with paper towels. Serve immediately. I have tried out many chicken recipes but this is really new to me. I’ll add this to my cook book. Thanks a lot. Thanks for the kind comments on this blog. I hope you enjoy the recipe and let me know how it turns out.